The retired three-star general pleaded guilty last year to lying to the FBI about conversations he had with the then-Russian ambassador to the United States during Trump’s White House transition. In a filing this week, his lawyers highlighted Flynn’s long and distinguished military service and extensive cooperation with prosecutors in asking that he be sentenced to probation and community service, rather than prison. The special counsel investigating whether Trump’s 2016 Republican presidential campaign coordinated with Russia has said Flynn was so helpful that he was entitled to avoid time behind bars, even though sentencing guidelines recommend up to six months in prison. In the time since he left the White House just weeks after Trump’s inauguration, Flynn has moved back to Middletown, Rhode Island, where he and his wife, Lori, grew up and where they have a deep social network. Several supporters who came together in a private group chat on Twitter plan to rally outside the federal courthouse when he is sentenced, according to organizer Pasquale Scopelliti. 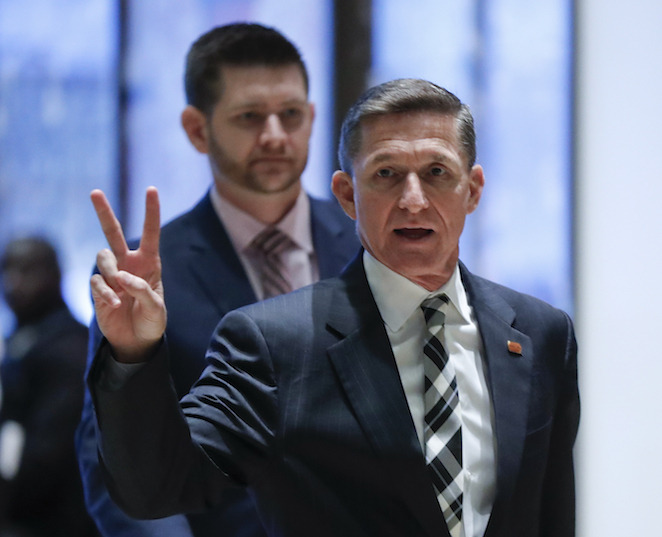 Flynn wrote a foreword to Scopelliti’s self-published book, “America First: The MAGA Manifesto,” earlier this year. He said Flynn was not involved in the rally.